Trent Alexander-Arnold was playing rugby. This was in a different life, some distance from Anfield – even further from Kiev. This was on a muddy field, where the green hills run down to the North Walian coastline. His physical education teacher at St Mary’s in Crosby can remember one of his first games. “He was a centre forward for the football team and a full-back in rugby,” recalls Derek Williams. “He scored lots of goals and lots of tries.” One of those tries came against Rydal in Colwyn Bay. And so, this was one of Alexander-Arnold’s first experiences of playing as a full-back. On Saturday night, he will operate the same position – only this time as a nineteen-year-old in the Champions League final. The opponent will not be a thunder-thighed Welsh fledgling but, instead, Cristiano Ronaldo. Alexander-Arnold would leave St Mary’s aged 14 at the insistence of the decision makers at Liverpool’s academy. The club has a link with another school in Rainhill, which allows intake to balance football with education. Trent’s older brother Tyler is 23. His younger brother, Marcel, is 16. Each have attended St Mary’s, which is a fee-paying school. “A footballer from a fee-paying school?” the armchair cynics might scoff – thinking this is another droid out of touch with reality. Yet it is a mark of Alexander-Arnold’s memory and generosity that he did not forget the key role played by early influences like Williams, who will be in Kiev as a guest of the family and his sponsor, Under Armour. 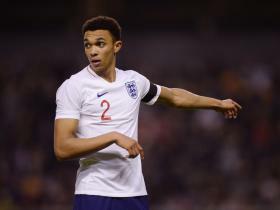 You learn more about Alexander-Arnold’s personality when you find out he went back to St. Mary’s – as well as Rainhill – to help out with assemblies and hand out awards, but not because Liverpool suggested it was a good idea. He was not chaperoned. He went by himself simply because he thought it was the right thing to do. The former student is described by teachers as, “A very determined young sportsman.” Williams has taught 17 professionals during his time at St Mary’s, including Carl Fearns, the back-row forward currently contracted to Lyon in France, and Gavin Griffiths, the pace bowler who moved from Lancashire to Leicestershire last summer. Morgan Feeney, the Bootle-born centre back who made his debut for Everton last season, is also on the list – and he’d been in the same year as Alexander-Arnold. There is another story which reflects this determination, back when he was aged six or seven – long before St Mary’s. This was a footballer so talented that when Liverpool spotted him, and realising they could not sign him for another year, they pretty much hid him at a Sunday league team with trusted links to the club so he could still play but send the vultures away. Alexander-Arnold was in the same league as Raheem Sterling and Ben Woodburn when it came to notoriety inside Liverpool’s academy. Each player was capable of mistakes but they would learn from those mistakes. If they were told something, they would only need to be told once, whether a positive or negative. Alexander-Arnold has never given much away in terms of emotion. He is more of an introvert. When he trained for the first time with Liverpool’s first team, he trained well but for weeks he kept himself to himself. Jürgen Klopp wanted him to engage more, to bring the confidence out of him. The advice from those that had worked with him previously was to offer him lots of feedback. He craved information – though not necessarily to know that he was performing to expected standard. He wanted to learn. On that basis, Klopp made a point of sitting down with him regularly, going through his expectations: outlining his beliefs and speaking to him about football. Klopp is traditional in that sense. Academy players are used to coaches explaining everything. In training sessions, Klopp outlines the drill, watches, and repeats until they get it right. The aim is for actions to become natural. He only intervenes if there is a collective problem rather than an individual. He believes it is for the individual to figure out situations. Once training sessions are completed, this is when he becomes more paternalistic. On that basis, the relationship between Alexander-Arnold and Klopp bloomed. To leave the Anfield’s changing rooms, each player passes through a mixed zone where journalists wait with their notepads and their Dictaphones. Liverpool’s players are generally fair with their time. Klopp likes them talking to the media because he believes it helps them take responsibility, taking account for what they say. In an industry where many Alexander-Arnold’s age would prefer to shuffle past wearing their headphones, he stops even in defeat. He is challenging himself, he is not looking for someone to help him out. He is impressive. His approach and manner reminds of a more open time, like it was at Melwood all those years ago when players and journalists would digress in the car park after training sessions. On Monday afternoon, Dejan Lovren joked that Alexander-Arnold looks like a 14-year-old but acts like someone who’s a lot older than his real age. It is his sense of purpose that impresses most. He seems to already know where his future lies. From here, it feels like it would be a major surprise if he does not end up captaining Liverpool.